Email has an ROI of 44x and 174% more conversions than Social Media*. It's far from being dead, so it's time to make the most out of Email Marketing. Planning a marketing campaign can be a lot like juggling 3 cats, whilst feeding your baby and doing budget spreadsheets at the same time. It's time to take back control of our Marketing Campaign plans before they run away! 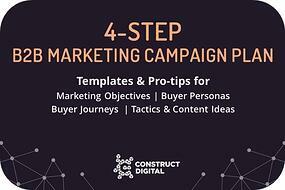 Use our 4-step B2B Inbound Marketing Campaign Plan Template to identify and organise your objectives, buyers, tactics and content. Hence this compendium of free B2B Email Marketing Best Practices, curated from our years of doing Email Marketing for clients such as Conrad, SAP, and more. With it, you'll get to the top of your prospects' minds and on the tips of their speed dial. Hit the ground running with our free Marketing Campaign Plan! We take your privacy seriously. Any information provided to us will be kept in strictest confidence.